This entry-level reverse apex shed benefits from some impressive stand-out features. Not only does the shed look more attractive than standard overlap buildings, but it is also designed with easy assembly in mind. It comes with a factory fitted window and door, meaning you don’t have to worry about installing them yourself. The fixed window is glazed with styrene which is both tough and shatterproof. Due to the reverse apex design, it is fitted onto the front of the shed, along with the door. As it is built from overlap cladding, it does have a rough appearance, though you could improve this by adding a coloured treatment. The door of the shed is fitted with a pad bolt so that it stays closed when you need it to. It also enables you to fit a padlock, though as this isn’t supplied you will need to buy one separately. If you follow the annual treatment advice, you will also benefit from a great 10 year anti rot warranty. As it is built with budget in mind, it doesn’t offer much security. However, you only need to spend a little extra to ensure your storage is adequately protected. 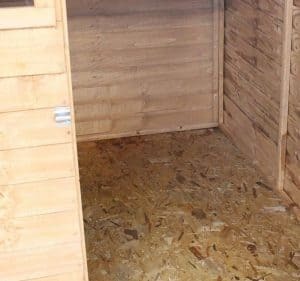 The solid sheet floor may also be a little too thin to cope with heavy equipment so we’d mainly recommend this shed to those who have lightweight, general storage needs. This Windsor reverse apex wooden storage shed is built with value, as well as quality in mind. 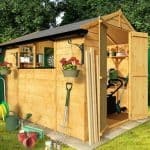 It is more of an entry-level shed, but it does have a few top quality features. Like a lot of the sheds built these days, it comes supplied with a solid sheet floor. Whilst this is typically adequate enough for general gardening equipment, it wouldn’t really be suitable for heavy machinery. So if you’re looking for a building you can work in, this wouldn’t be a good choice. 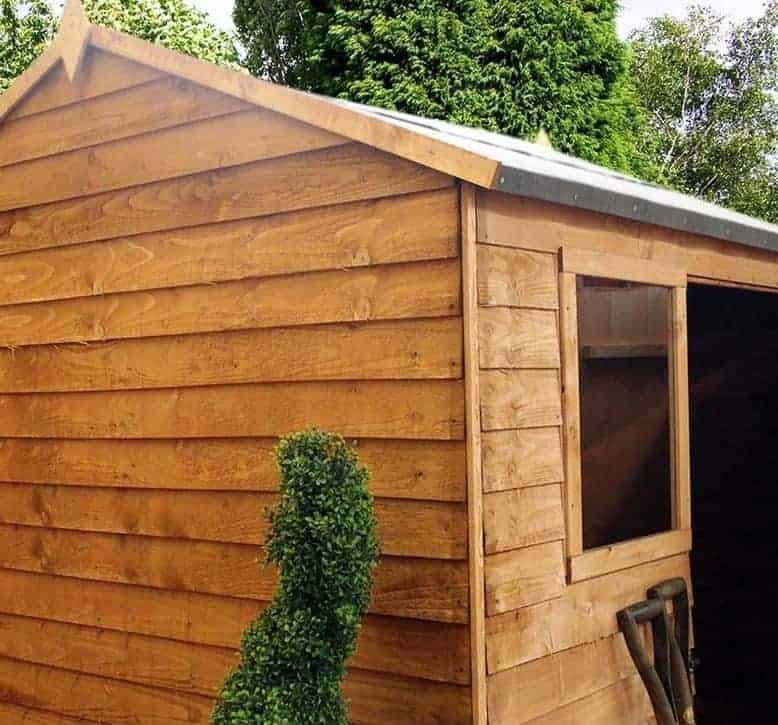 The ridge height and door width are the two most distinguishing measurements of this shed. Apex sheds are notably taller anyway, but this one is even taller than many of its competitors. This makes it one of the best buildings for storing really tall tools or equipment. As the door is also wider, it helps to make getting into the building a breeze – even with awkward items. The reverse apex roof is one of the stand-out aesthetic features of this shed. It runs diagonally down the front and diagonally down the rear of the building. There is a very slight overhang included so rainwater will simply fall off onto the ground, rather than running down the cladding. A mineral felt covers the roof, though personally we feel the quality of this could be better. However, it still offers pretty good protection and we estimate it will last approximately 1-2 years. It is made from reliable solid sheet board which is lightweight but sturdy. The floor is constructed from solid sheet board too. However, whilst this provides a strong and stable structure for the roof, it isn’t as useful on the floor. This is because the floor needs to be able to accommodate potentially a lot of weight. It really depends upon what you want to store. If you don’t have anything heavy, then the floor will definitely be adequate enough. Traditional style overlap is used for the cladding, which is basically rough-sawn timber that overlaps to stop rain getting inside the building. At just 8mm thick, it isn’t going to provide the strongest protection against the elements, but with the right treatment it is guaranteed to last for 10 years. You will need to be wary of where you erect the shed however. The trouble with overlap is that it is susceptible to warping. If it is exposed to strong, harsh sunlight, there’s a very high risk of it either discolouring or shrinking. Many people have found this out the hard way so we definitely advise you to install this shed in an area which is exposed to as little sunlight as possible. The main benefit of overlap of course, is that it is the most affordable type of construction. It may not be the strongest, but it is still reliable and durable if treated. As for the framing, a 28mm x 28mm standard frame is used. 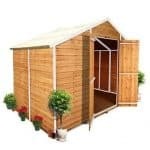 This is what you will find on most sheds and it does offer a very good support; especially for overlap cladding. 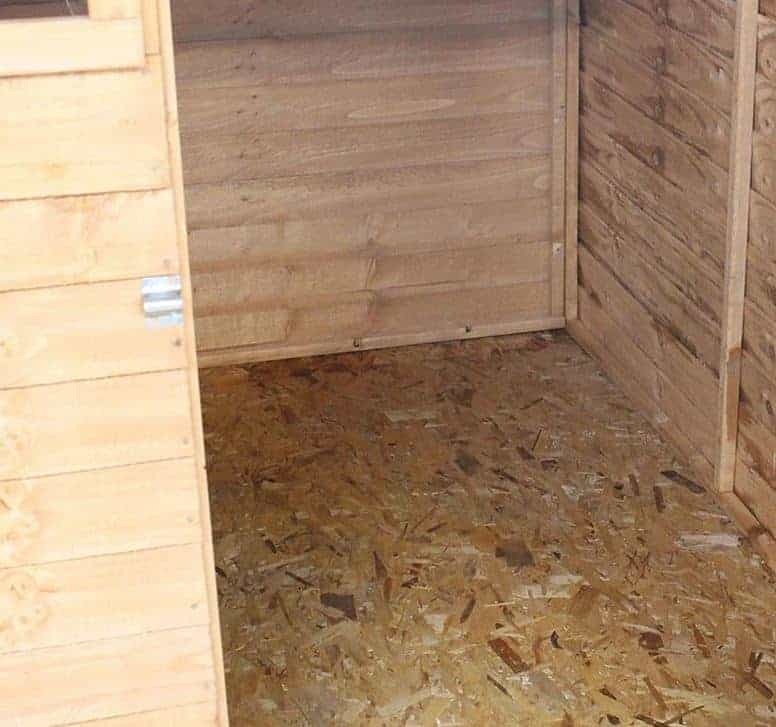 The 10 year warranty really gives this shed excellent value for money. However, it is very important to know that this warranty will only apply if you treat it well. 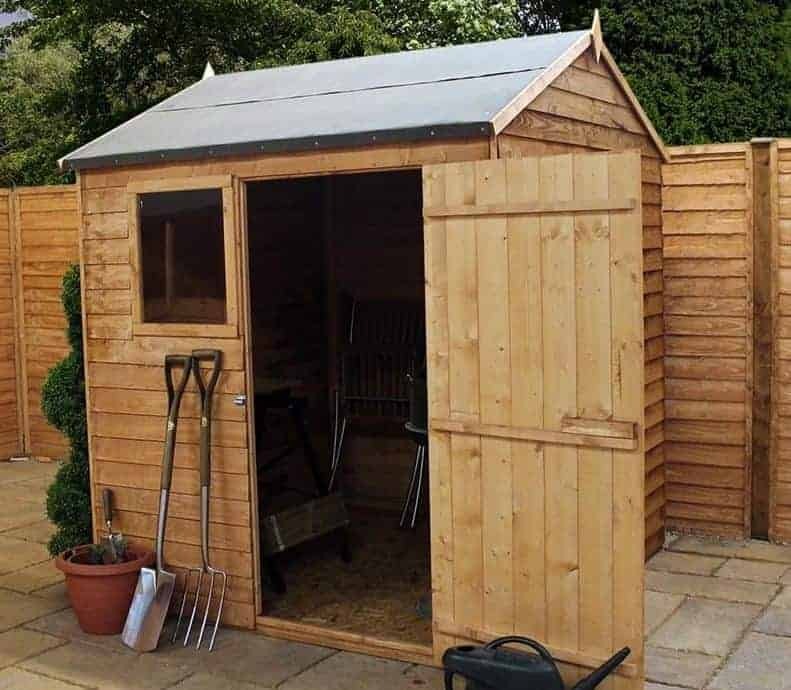 Annual maintenance is recommended by the Shed Store, though you could technically get away with skipping the first year’s treatment. This is because a dip treatment is added to the timber before it is sent for delivery. This coats the surface with a weather resistant barrier, just like a water treatment. It is strong enough to last for around a year, though for peace of mind you may like to treat it after assembly anyway. You are provided with a free tub of treatment so it won’t cost anything extra and it will enhance the protection already provided by the Dip treatment. There is another treatment option you can take. Spirit based treatments are the ones we advise to be used on overlap timber. They work both on the surface and inside the actual wood. So you’re left with a longer-lasting protection. You can also benefit from treating the shed every couple of years, rather than annually. One medium size fixed window is fitted to the front of the shed. This uses shatterproof styrene glazing; reducing the risk of injury if it does get broken. It comes with a wooden frame surrounding it, making it more of a stand out feature, though it does blend in nicely with the overall construction. A wide, ledge single door is also included on the front of the shed and it uses pretty wide panelling. There is a strong pad bolt attached which helps to secure the door, though it will not lock it. The purpose of the bolt is to stop it from opening by itself. The great thing about the door and window supplied with the shed is that they come already fitted. The manufacturer fits them into place at the factory before they are shipped. So erecting the shed is much easier and faster. The security and privacy of the shed could be improved. In fact, as sold it isn’t very secure at all. You do have the pad bolt, but as mentioned this is purely there to keep the door shut. It does not act as a lock, but it does provide a very good place to attach a padlock. If you shop around, you can find high quality padlocks at very affordable prices. So improving its security isn’t going to be expensive. Improving the privacy on the other hand is an entirely different matter. If the shed was constructed with thicker cladding, we would suggest adding a covering such as a blind. Unfortunately, as it is made from overlap this isn’t possible. Now if you do buy a secure padlock, potentially one that sounds an alarm when tampered with, the lack of privacy wouldn’t pose much of a problem. However, we would still advise that you make sure anything of value is covered away from view. There is one extra and one customisation option offered with this shed. The extra is a DIY assembly assistance tool kit. 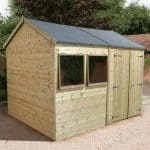 This could actually prove very useful both with the installation of this shed and for future assembly of any outdoor buildings you purchase. This comes with a lot of different types of tools including safety goggles and gloves, a hammer, a 16 inch saw, safety knife and brushes for adding treatments or paint. The customisation option available is a selection of coloured treatments. These will help you change the colour of the shed, providing a more stylish finish if you aren’t a fan of the rustic natural look. Red Cedar, Dark Brown, Ivy Green and Light Brown are the colours available and each is a water based 5L treatment that is environmentally safe and they offer excellent weatherproof protection. This is one of the better quality overlap sheds, benefitting from a few great features. Although the cladding is thin, when treated annually it provides excellent longevity and is a sturdy little building. You can rest assured that with regular maintenance, this shed will last around 10 years, if not more. The only thing you need to watch out for is warping, but you can minimise the risk by assembling it in a shaded area. 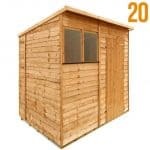 This shed is largely suitable for those who have limited storage needs. 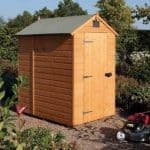 As it is mostly created with maximum medium weight storage in mind, what you can store in the shed is fairly restrictive. You also cannot nail shelving or hooks onto its walls so the floor space is all you have. Assembly of this building is a lot easier than many competitor sheds. This is because the door and the window come factory fitted. You won’t need to worry about getting the door aligned correctly for example. It’s said that this useful feature can cut up to two thirds off the installation time. So you should find it a breeze to put together. If all you need is a small storage facility, this is an excellent value model to consider. Taking into account its low purchase price, the few extras required and the installation time you save thanks to the factory fitted window and door, you’re left with incredible value for money. 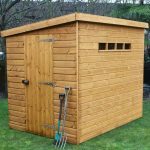 Final Thoughts: This Windsor overlap reverse apex shed offers a great attractive design. Suitable for general gardening bits and bobs, you’ll love the fact it comes with a factory fitted door and window. This makes assembly a lot easier. Shed Store also throw in a free treatment with the shed, meaning you save money for the first year of the sheds life. It has been dip treated, but as it is created with overlap cladding it is still recommend that you treat the building yourself once erected and yearly thereafter. It is a simplistic, no frills storage shed that is designed with value for money in mind.